The Walt Disney Studios invites everyone to get the party started as the Mickey Mouse Clubhouse gang – Daisy, Mickey, Donald & Goofy – celebrate MinnieMouse’s birthday. We love Minnie and Mickey in the Loehner household. I grew up watching Mickey and without hesitation Mickey Mouse Clubhouse is Mini Me’s favorite cartoon to watch! She has a morning routine of breakfast, a story and then a half hour with her favorite characters! She was really into Daisy Duck for awhile and let me tell ya…it’s hard finding just Daisy Duck stuff. Thankfully, she was happy with Minnie and Daisy! She loves the car trip episode that they took with Mickey and always laughs at “Broccoli Farm, 10 miles ahead, Broccoli Farm, Broccoli Farm!”. Have a magical day with Mickey and Minnie with crafts and then watch the movie, just like we did! You can download and print two FREE Coloring pages, some yummo finger foods and super fun crafts! I was chosen to throw a Minnie Mouse House Party…Yea! We have been getting ready all day baking goodies and making crafts for tonight. 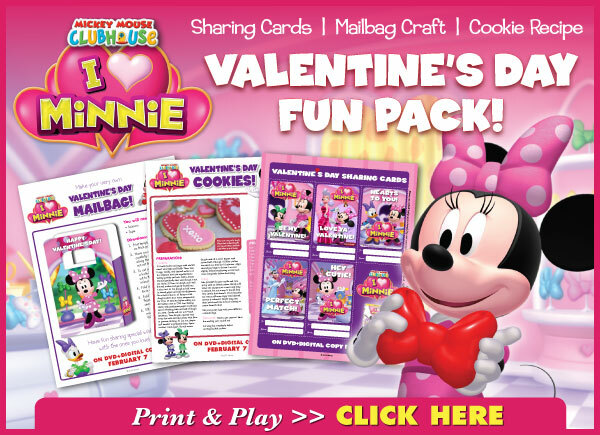 Mini Me is having a few friends over after dinner for a little Valentine’s party and to watch the new I Heart Minnie video. Find Mickey Mouse Clubhouse on Amazon.com ! Visit the Mickey Mouse Clubhouse Website for games, episodes and more! This is great, her birthday is coming up in 4 months and she can have a creative party with pals and moms can help out to. This is way to cool. Great ideas for our girls to express themselves and have a lot of fun doing it. Thanks so much.